Become a Save Maumee Member TODAY ~ Purchase a Membership! …because one day is just not enough to plant 460 trees! See what our largest event is all about! EARTH DAY! 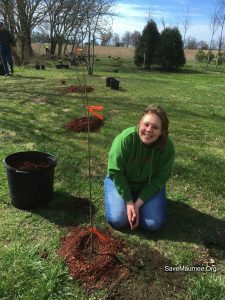 Earth Day 2017 ~ YOU planted 1,100 trees in 3 days! THANK YOU! Abigail King stood under sunny skies Sunday, hoping rain was in the forecast. 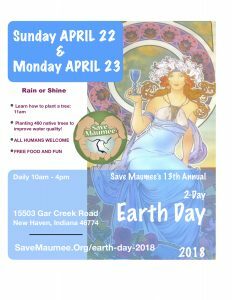 Along with dozens of others, the Save Maumee Grassroots Organization founder marked the group’s 13th annual Earth Day celebration planting 380 trees along a stream in rural Allen County. 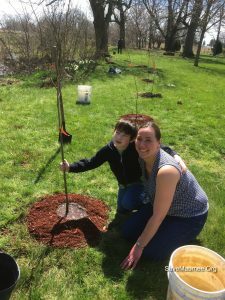 The event continues at 10 a.m. today at 15503 Gar Creek Road, New Haven, with the planting of 80 trees. The public is welcome. “Come ready to work, ready to get dirty,” said Alissa Hart, Save Maumee’s board secretary. The volunteers’ labor is part of Save Maumee’s effort to implement the Upper Maumee Watershed Management Plan. Known as the riparian buffer initiative, Save Maumee’s project includes removing invasive species and installing 2,780 native trees and shrubs along the county’s most degraded streams. Upon completion, the work should reduce nitrogen, phosphorus and sediment levels and annually capture more than 164,000 gallons of untreated urban runoff, according to the organization. Nearly 350 people contributed to restoration sites in the last two years, with 1,157 and 2,107 volunteer hours logged in 2016 and 2017, respectively. “This is built on the backs of volunteers,” King said. Even children have helped. Volunteer Bob Bobay brought his 8-year-old daughter, Autumn, who planted three trees, he said as the group gathered for a sandwich lunch. 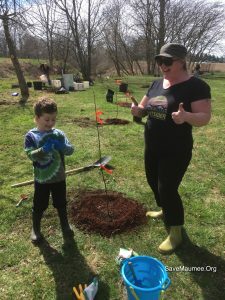 Hart, who also brought her 8-year-old daughter, said the experience is valuable for children because they learn what it takes to remediate land and the effort that goes into planting one tree. Save Maumee’s involvement with the new trees doesn’t begin and end with the planting stage. Volunteers prepped the area beforehand by removing invasive species. Now, Save Maumee must maintain the trees, Hart said, noting they could be knocked down by flooding. They also need watering – a time-consuming task, King said. That’s why she wants rain in the forecast, preferably in the next four to five days. “It’s hard to get trees to grow,” she said. Save Maumee Riparian Buffer Initiative Project boundaries are within Allen County’s Upper Maumee River, Western Lake Erie Basin and are considered part of The Great Lakes Restoration Initiative Area of Concern. These projects are made possible through the federal Great Lakes Restoration Initiative (GLRI) and U.S. Forest Service. • Create partnership with land owners and land managers, 130 different volunteers logged over 876 hours at this site!